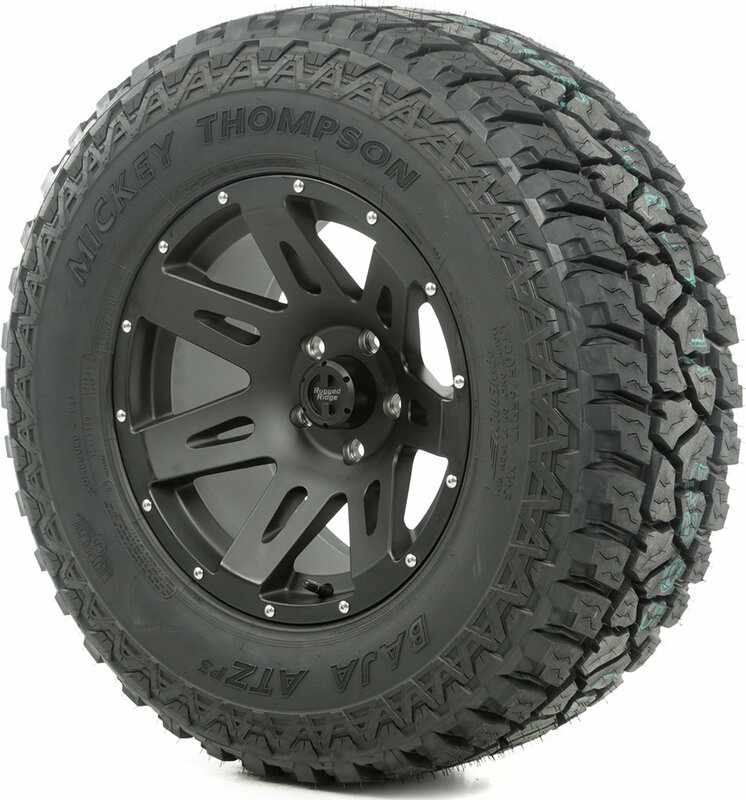 This wheel and tire package from Rugged Ridge includes a Mickey Thompson ATZ P3 tire mounted on a 17", 18" or 20" XHD alloy wheel. This tire is mounted and balanced with a TPMS sensor for Jeep® Wrangler JK vehicles. Rugged Ridge introduces a great looking yet durable powder coated cast aluminum wheel that exceed SAE J2530 standards. Featuring a Hub Centric design that centers the wheel over the hub providing the best fit possible and the proper clearance for brake rotors, steering components and suspension. The Baja ATZP3 has a unique "hybrid" design between an all-terrain and mud terrain to give you the grip you need for your weekend adventures and the smooth ride to get you down the road in comfort. Features an extra wide footprint and beefy tread blocks for great all around traction. All sizes feature PowerPly 3-ply sidewall construction. Rim Size: 17.0" or 18.0" or 20.0"
Tire Height: 32.60" or 34.40" or 37.00" or 32.40"
Tire Width: 12.0" or 12.4" or 12.5"